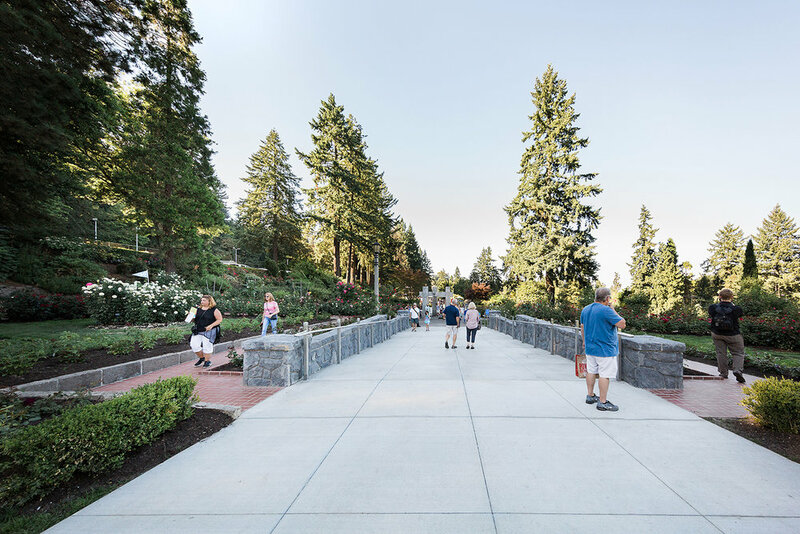 The Washington Park International Rose Test Garden accessibility improvements project renovated a portion of the garden to increase accessibility and visitor enjoyment. In preparation for the Rose Garden’s Centennial Celebration in 2017, Portland Parks & Recreation tasked a team led by GreenWorks with this project whose primary goal is to ensure the public’s safety by removing barriers to access and provide accessibility upgrades to meet current ADA standards while maintaining and enhancing the historic character of the Rose Garden. The Main Promenade features a new ADA ramp system with stone walls and formal handrails to complement the iconic sculptural water feature. GreenWorks managed a complex design team of engineers and accessibility experts providing site design, construction drawings and specification documents. GreenWorks facilitated a 3-day design charrette with Portland Parks & Recreation and the design team. Additionally GreenWorks provided 3D visualizations of design elements and developed presentation graphics for the public engagement process.